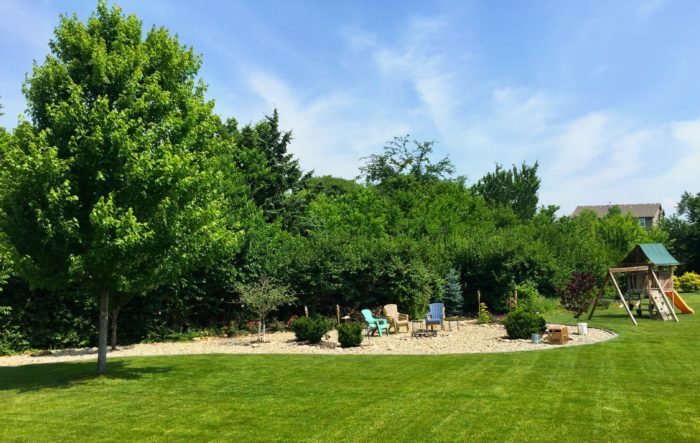 Whether you are a new or veteran homeowner with a septic system, one question may be on your mind, “Can I landscape my drainfield?” This is a popular question because often septic systems are installed in conspicuous areas which may expose unsightly system components. Though it is recommended to keep these components accessible, there are ways to landscape your drainfield that improve aesthetics while keeping certain parts of your septic system available for repair and maintenance. First, it is wise to consider several factors before doing so. Begin with choosing the best plant for the area. The septic system drainfield typically contains pipes buried from 12 inches to 36 inches (depending on your system) below the ground. This does not leave much room for root growth. As a result, we recommend that you choose non-invasive perennials with shallow root systems. Most perennials have a root system that grows in a mat formation (surface roots) that is likely to remain above the drainfield. Woody ornamentals, shrubs, and trees usually have a taproot that extend deeper into the ground. Secondary roots grow laterally from the taproot and greatly increase the chance of growing into the drainfield pipes. This can cause the system to fail. Several plants are identified by the North Carolina Cooperative Extension as suitable for drainfield plantings. These plants are listed in the tables below. They are organized according to their sunlight requirements. *Will thrive in full sun or part shade. The NC Cooperative Extension does not recommend planting trees in the drainfield. Instead, plant them at least 25′ from the area. Keep in mind the soil surrounding a drainfield will have increased nutrients. This could encourage the tree to grow at an increased rate. It is wise to use caution when choosing trees near the drainfield. There are several species that are not recommended. These trees tend to be water lovers with roots that reach deep and wide. Table 4 lists problem trees. There are a few species of trees that make for a better choice. If a tree is used around the perimeter of the drainfield, then it is recommended to consider the species listed in Table 5. Notice these are smaller trees. White and Red Oak Quercus spp. * These plants naturally grow in a bush formation however they are commonly maintained as a tree in North Carolina. As a precaution it is a good idea to wear gloves when planting in a septic drainfield. Do not add soil to the drainfield when installing the landscape. Added soil will stifle the system. Instead, prepare each hole twice as wide as the root ball. Scratch the sides of the whole with a shovel to encourage establishment then add soil amendments. Using a tiller in this area could be risky. Consider using a small one that is easily controlled. Remember the septic drainfield pipes are only 12″ to 36″ below the surface. The soils in a drainfield contain many of the nutrients found in commercial fertilizers. As a result, adding fertilizer to the plantings could do more harm than good. The best way to know whether fertilizer is necessary is by taking soil samples of the drainfield. The local Department of Agriculture provides this service for free. Simply go by your local Cooperative Extension office for a sample box and form to submit to the NCDA. Contact the office for details: Chatham Co. (919) 542-8202, Orange Co. (919) 245-2050, and Wake Co. (919) 250-1100 or use the link at the bottom of this document for additional information. An alternative to landscaping is the use of container gardens or a container garden with a trellis or decorative fence. Evergreen flowering plants such as Camellias, Loropetalum, Carolina Jasmine (Trachelospermum asiaticum) or Confederate Jasmine (Trachelospermum jasminoides) planted in the container will provide an attractive disguise for septic risers or control panels. Other alternatives include 1.) Incorporate the septic risers into a flowerbed but cover them with pine straw or mulch instead of soil. 2.) Camouflage the septic risers by painting them a similar color as the mulch for pine straw. 3.) Cover the components with an imitation rock. 4.) Many of today’s trendy locally owned garden centers have interesting metal works, statues, and various other artistic items that can be used to place in front of septic risers or control panels. Then annuals may be planted in front of or around these items to create a nice camouflage. It is not recommended to permanently cover the septic system’s access risers. Alternative practices to camouflage these components are acceptable, however burying the risers could be costly to the homeowner when the system is maintained or repaired. Very often AWT will go do a septic inspection and find the septic tank is covered by a patio, deck, or even a driveway. In order to properly inspect and maintain the tank, these features need to be removed and no one wants to have to do that when they are buying or selling a home. Cooperative Extension Agencies across the nation do not recommend planting a vegetable garden in a drainfield. Various bacteria and viruses from the effluent may be absorbed by the vegetation.